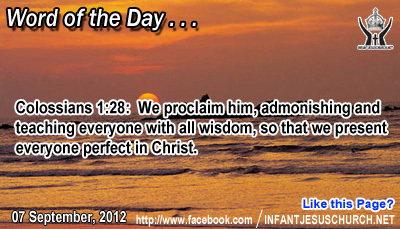 Colossians 1:28: We proclaim him, admonishing and teaching everyone with all wisdom, so that we present everyone perfect in Christ. Heavenly Father, conform our heart, our words, our life, and our actions to those of Jesus. We want him to be our Lord, not just in our words but also in our life. In Infant Jesus' holy name we pray. Amen. In Jesus' times, wine was stock up in wineskins, not in bottles. New wine poured into skins was still fermenting. The gases exerted gave pressure to the skin. New wine skins were elastic enough to take the pressure, but old wine skins simply burst because they turn into hard as they aged. What did Jesus denote by this relationship? Are we to reject the old in place of the new? Just as there is a right place and a right time for fasting and for feasting, so there is a right place for the old in addition to the new. Jesus says the kingdom of heaven is like a householder who brings out of his wealth what is new and what is old. How impoverished we would be if we only have the Old Testament or the New Testament, rather than both. The Lord Jesus gives us wisdom so we can make the most excellent use of both the old and the new. He doesn't want us to hold strictly to the past and to be opposed to to the new work of his Holy Spirit in our lives. He wants our minds and hearts to be like the new wine skins – open and prepared to receive the new wine of the Holy Spirit. Are we keen to grow in the knowledge and sympathetic of God's word and plan for our life?